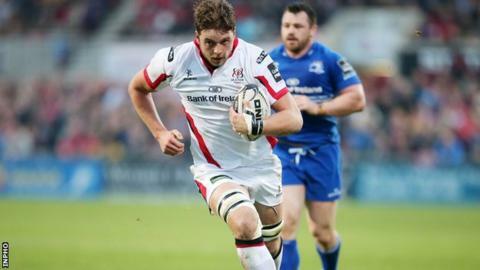 Iain Henderson says Ulster and Munster players will be trying to "stake a claim" for World Cup places when they clash in Saturday's Pro12 game. The winners will take a big step towards securing a home semi-final when they meet at Kingspan Stadium. There will be a lot of personal battles on show between Ireland team-mates. "The players know a lot rides on these inter-pro games because of what's at stake not just for the team, but as individuals," said Henderson. Munster flanker Peter O'Mahony is Ireland's first choice number six but it is a position coveted by Henderson, who was propelled straight into Six Nations action after a hip injury this spring, playing as a replacement in both the second and back rows. "For the Irish coaching staff they get a direct show, like a one-on-one of players going against each other for the same position," said the versatile Ulster player, speaking at a launch in Dublin on Wednesday. "Anyone who has ever played in an inter-pro game knows that the intensity is lifted and the physicality is lifted. "We've had it in the last two games against Connacht and Leinster and it will be no different this weekend. It will be as physical or more physical against Munster. "Munster will be coming up looking for a win to get a home semi-final and, likewise, we will be doing the same thing."